Facebook will soon be ending the @Facebook.com email service that through was seamlessly integrated into Facebook remained unused and was just there serving no purpose. The Verge has reported that the @facebook.com will now only as a forwarder and by default forward all emails to the user’s primary email address, user’s can still turn-off this feature. “Most people have not been using their @facebook.com email address,” said a Facebook spokesperson, who confirmed that the update effectively retires the social network’s email service. 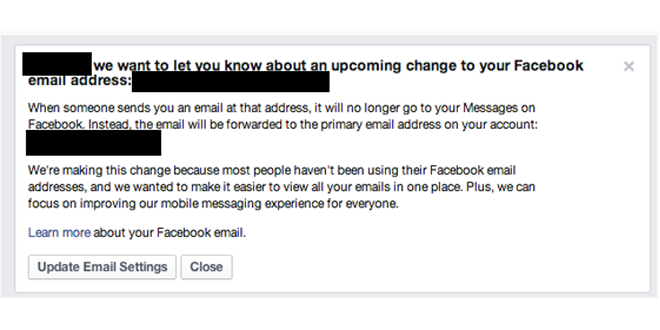 Facebook email service was launched back in 2010 and just four years later Facebook has decided to retire it. Two Moons on the sky in August 27,2010? Previous: New York Jets considering Michael Vick? Next: Mila Kunis & Ashton Kutcher ENGAGED!